KIEV, Ukraine -- The Organization for Security and Co-operation in Europe, which is monitoring a fragile ceasefire in rebel-controlled eastern Ukraine, is open to sending armed personnel there, but only if that is agreed by all sides, its chief said on Monday. 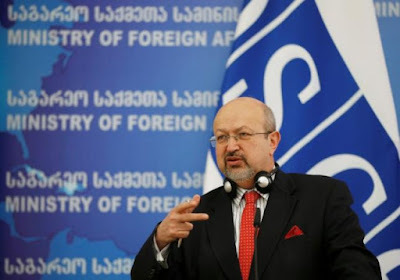 Organisation for Security and Cooperation in Europe (OSCE) Secretary General Lamberto Zannier speaks during a news conference in Tbilisi, March 9, 2015. OSCE Secretary General Lamberto Zannier's comments are a measure of the threat to unarmed staff observing a ceasefire between Ukrainian forces and Russian-backed separatists that is constantly violated, killing soldiers and civilians. During a trip to Kiev, Zannier said monitors had been threatened, shot at, had their access restricted, and harassed -- mainly on the rebel side. The OSCE's current mandate in Ukraine is as an unarmed civilian mission to monitor and help implement the ceasefire. Zannier said various proposals had been floated to beef up the OSCE's presence but nothing concrete had emerged yet. "There are some ideas for a police contingent, there are some others for 'let's give a weapon to the monitors', especially on the contact zone," Zannier said. "We need to have consensus so everybody has to agree." The February 2015 Minsk ceasefire deal has failed to completely halt a conflict that is now in its third year and has killed more than 9,300 people. After a relative lull towards the end of last year, there has been a sharp rise in the deaths of Ukrainian soldiers. Some 20 were killed in April alone, compared with five in January. Both sides accuse the other of violating the terms of the truce, which includes a pullback of heavy weapons. Zannier said the OSCE had counted 1,000 ceasefire violations on Sunday alone, while in some areas the enemy lines had moved closer to each other, sometimes being only 100-150 metres apart. "We kept encountering obstacles to the freedom of movement. In some cases, especially on the side of the rebels, we have had episodes of harassment. In some cases, in one case, we had a vehicle shot at and the glass broken," he said. "For us to be effective, we need also the people on the ground to be more cooperative and to have access to everywhere we want to go." OSCE's current mandate in Ukraine is as an unarmed civilian mission to monitor and help implement the ceasefire. Visit : Best essay writing service .